B.V.Sc. & A.H, M.V.Sc., Ph.D.
Satyaveer Singh Dangi, Mahesh Gupta, Vimla Nagar, Vijay Pratap Yadav, Saroj K. Dangi, Om Shankar, Vikram Singh Chouhan, Puneet Kumar, Gyanendra Singh and Mihir Sarkar (2014). Impact of Short-term heat stress on physiological responses and expression profile of HSPs in Barbari goats. International Journal of Biometeorology. Published online on 09 March, 2014. Springer Publishers. Sharma, S.; Ramesh, K.; Hyder,I. ; Uniyal.S. ; yadav, V.P. ; Panda, R.P. ; Maurya,V.P. ; Singh,G. ; Kumar, Puneet; Mitra,A. ; and Sarkar, M. (2013). Effect of melatonin administration on thyroid hormones, cortisol and expression profile of heat shock proteins in goats (Capra hircus) exposed to heat stress. Small Ruminant Research (Elsevier, USA) 112: 216-223. Ramesh, K.; Hyder,I. ; Uniyal.S. 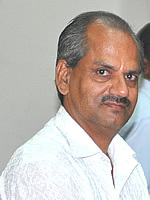 ; Yadav, V.P. ;; Panda, R.P. ; Gupta, M.; Dangi, S.S.; Maurya,V.P. ; Singh,G. ; Kumar, Puneet; Mitra,A. ; Sharma,S. ; and Sarkar, M. (2013). Modulation of physio-biochemical responses and relative expression of heat stress associated genes by melatonin in goats exposed to heat stress. The Journal of Veterinary Science. 114: 207-217. Kumar, Puneet; Saini, A.L. ; Sood, S. B. and Singh, Khub (1993). Micro-environment in East - West and North - South oriented sheds and its impact on physiological responses in goats in hot-dry environment. Indian Journal of Animal Sciences. 63 (6) : 674-78. Kumar, Puneet and Singh, Khub (1993). Effect of shearing on thermo-adaptability in goats of arid and semi-arid zone of India. Indian Journal of Animal Sciences. 64 (3): 290-94. Kumar, Puneet and Singh, Khub (1994). Consistency in cutaneous moisture loss in goats of hot semi-arid region. Indian Journal of Animal Sciences. 64 (1):100-01. Singh, Khub; Kumar Puneet; Saini, A. L. and Bhattacharyya, N. K. (1989). Micro-climate within three types of literoof sheds in hot semi-arid zone. Indian Journal of Animal Sciences. 59 (8): 997-1005. Singh, Khub; Kumar, Puneet; Saini A. L. and Bhattacharyya, N. K. (1989). Influence of commonly used roofing materials on micro-climate in animal houses in hot semi-arid zone. Indian Journal of Dairy Sciences. Vol. XLIV (3) : 144-47. Das, S. K.; Kumar, Puneet; Singh, Dharm and Singh, Khub (1994). Effect of water restriction on thermoregulatory responses in bucks. Indian Journal of Animal Sciences. 64 (8): 899-901. Kumar, Puneet and Singh, Khub (1999). Effect of acute dehydration and rehydration on excretion of primary electrolytes in urine of bucks of arid / semi-arid zone of India. Indian Journal of Small Ruminants. 5(1): 46-48.